this week felt very unfruitful yet we have managed to bring at least some news from the Factorio development. So it is the time of the year when flus and viruses flourish everywhere. The weather is changing fast - one day it is warm and the next one the temperatures drop below zero. There is sneezing and coughing everywhere. I have spent some time in bed last week. Then Kovarex spent most of the week in bed this week. As a result the development efforts have been seriously hurt. We have kept fixing issues from the forums and doing small steps forward in the 0.12 branch. But in general it felt just like one of "those weeks" when not much is happening. One crash investigation here, BAM half a day gone. Fixing a small issue or two, another day over. Answering emails, half a day gone. Preparing tax documents and doing account (uff), another day gone. Repeated couple of times and suddenly it is Friday evening and it is time to write Friday Facts and I am just wondering where did the week go. On Monday we went for a dinner with guys from PixelFederation. They are indie developers from Bratislava, Slovakia. They focus on mobile development and are quite successful in their field. Their business model, team size and problems they are facing are quite different from ours but still (or maybe because that) we had a good chat sharing our experiences. They were even kind enough to offer us help in our current struggle with hiring new game developers. At least our graphics department has not been idle. Quite the opposite. They have spent most of their time working on the space content. 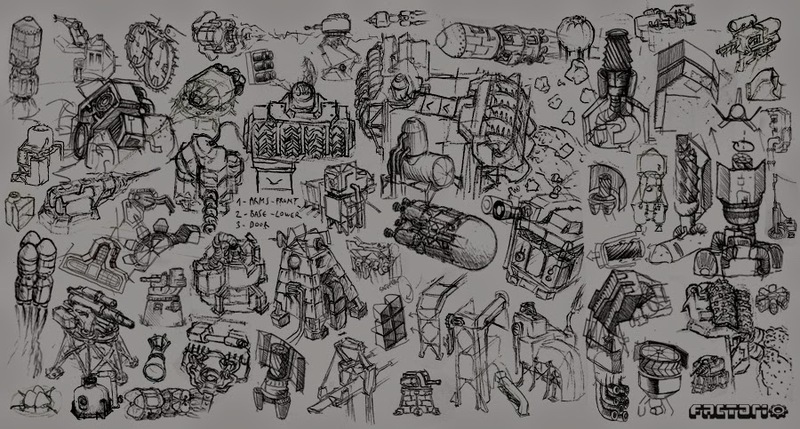 Below you can see a master sketch composition from possibilities that await the game in the future. If you would like to share something, the commenting thread is there at our forums.